Week by week we break bread in the name of Jesus. We do so not because it “feeds us” spiritually – which it does. Nor because there is more to worship than three hymns and a sermon – which there is. We do it as an act of obedience. “Do this,” Jesus said. And we do. For some Christians, the bread and wine of the Eucharist convey a direct and tangible encounter with the Risen Christ—the Eucharist for them conveys the “real presence” of Jesus. To others, the bread and wine simply function to jog the memory. They are a sort of visual aid to assist the Christian believer in reflecting on the sacrificial death of Christ. They certainly do not convey the immediate presence of Christ, except in so far as he is spiritually present whenever his Word is preached and his people are gathered. This distinction breaks down along Catholic – Protestant lines. There is not, however, a clean break between the two. 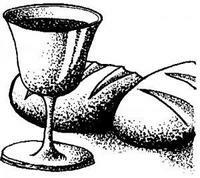 Varying views on the Eucharist lie at different points along a continuum, with the Roman Catholic emphasis on presence on one side, and a purely memorial notion of the Lord’s Supper on the other. The Baptists strongly advocate a strict memorial emphasis; Presbyterians and Methodists lean toward the middle. Lutheran and Anglican views are closer to Roman Catholicism, though with some important distinctions. It is one thing to catalogue various views on the Eucharist, and quite another to express with clarity and conviction what we actually think we are up to when we break bread in the name of Jesus. Yet scripture calls us to give “a reason for the hope that is in us” (1 Peter 3:15). If we wish to articulate a faithful and coherent understanding of the Eucharist, we must remember that Jesus said two things and not just one. Christians have spent a lot of energy setting “this is my body” over against “do this in remembrance,” emphasizing one, and functionally negating the other. Our understanding of the Eucharist needs to embrace both. Confusion often arises because the usual understanding of “remembrance” is too thin. Normally we “remember” what lies in the past – what by definition no longer present. The German critic, Gotthold Lessing (1729-1781), spoke of history as an “ugly broad ditch” that separates us from the events of the New Testament and renders them out of reach. In the same way, the typical notion of remembrance presupposes a gulf between the immediacy of the present and our memories of the past. By contrast, from ancient times, the Christians have embraced a “thick” understanding of remembrance in the Eucharist as an act that does far more than just call to mind something that took place many years ago. In a very significant sense, it brings it into the present. Christians did not invent this “thick” understanding of remembrance. We learned it from the Jews. 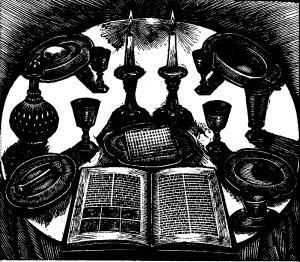 For a Jew during the Seder, the Exodus is not just back then; it is now! God has not just redeemed our ancestors; he has redeemed us! It is not just they who are freed from slavery; God is present in power now, redeeming us from slavery! In October of 1530, a gathering of Protestant leaders led by Martin Luther and the Swiss reformer, Ulrich Zwingli met at Marburg in order to resolve their theological differences and create a united front within the Reformation. They agreed on fourteen points, including the authority of scripture, and justification by faith, but their efforts reached an impasse on the nature of the Eucharist. Zwingli and the Swiss reformers were strict memorialists; they believed the bread and wine were purely symbolic. For them, the Jesus’ human body had ascended to heaven, and only his divine nature could be omnipresent. Luther believed deeply that Jesus humanity and divinity were inseparable and “ubiquitous” (universally present), and hence that Christ was really present “in, with, and under” the forms of bread and wine. As the discussion continued Luther grew agitated; he wrote hoc est corpus meum ("This is my body") in chalk on a wooden table and pounded it with his fist – giving dramatic expression to his conviction that the presence of Christ in the Eucharist was real and tangible. “You and I are of a different Spirit,” he sputtered in frustration. Where do we Anglicans stand? The fact of the matter is that Anglican teaching on the Eucharist has been a moving target over the years. The fact is: the traditional Lutheran understanding of the Eucharist is far more “Catholic” than the views of the Anglican reformers. Today, however, most Anglicans today embrace a notion of the “Real Presence” that is closer to Luther than Cranmer. Contemporary Anglicanism, though admittedly diverse, has rightly made adjustments in its theology of the Eucharist, with the result that we now affirm both presence and remembrance. After all, Jesus speaks of both. Why should we have to choose between one or the other?